The Iraqi government implemented new security measures a day after a string of bombings in Baghdad killed at least 100 people and wounded hundreds more, an interior ministry official told CNN on Thursday. The measures, ordered by Prime Minister Nuri al-Maliki, include additional security checkpoints across the capital, more stringent vehicle searches and random security stops. The stepped-up security followed a late-night meeting that included al-Maliki and Iraq’s defense, interior and national security ministers, along with senior representatives from the military and intelligence service. The six bombings — two targeting official buildings — struck Iraq’s capital within one hour Wednesday, killing at least 100 people and wounding more than 500. At least two people were killed Thursday morning when a bicycle rigged with explosives exploded in the Hafdh al-Qadhi commercial area in central Baghdad. Wednesday’s bombings marked the country’s deadliest day since the United States pulled its combat troops from Iraqi cities and towns nearly two months ago and left security in the hands of the Iraqis. 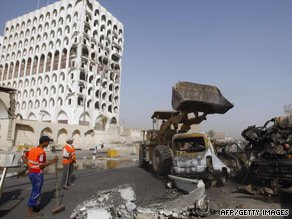 In one attack, a truck bomb exploded outside the Ministry of Foreign Affairs. The blast blew through the front of the building, sending some vehicles flying and leaving others in mangled twists of metal in the area, which is just outside the restricted International Zone, also known as the Green Zone. Another truck bomb went off outside the Ministry of Finance building and, in central Baghdad, a roadside bomb exploded on Kifa Street. More photos of Baghdad’s deadly day » A bomb also exploded in the Salhiya neighborhood, where on Tuesday security forces had avoided injuries by successfully defusing a truck bomb. Wednesday’s other two bombs exploded in eastern Baghdad’s Beirut Square, officials said. Two people believed to be connected to the bombings have been arrested, an official with the Iraqi army told CNN on Wednesday. The two suspects were driving in a car rigged with explosives when they were stopped by Iraqi security forces, the official said. The suspects were believed to be senior al Qaeda leaders, the official said. The United States pulled its combat troops from Iraqi cities and towns on June 30, leaving security responsibilities to the Iraqis but remaining in a training and advisory capacity. The U.S. military continues to conduct combat operations in areas outside cities and towns. Since then, al-Maliki has ordered his government to remove the concrete blast walls that line Baghdad’s streets and surround whole neighborhoods. The order does not cover the Green Zone, which houses Iraqi government buildings and the U.S. Embassy, military installations, government institutions, hotels and some private companies. Major incidents of violence in Iraq since 2008 include: August 7, 2009: At least 42 people were killed and 154 wounded in Baghdad in five attacks on the Shiite religious holiday. July 9, 2009: A series of attacks across Iraq killed at least 64 people and wound 167 others. May 20, 2009: A parked car rigged with explosives blew up outside a Baghdad restaurant, killing at least 40 people and wounding 83. April 29, 2009: Six car bombs in four hours killed 48 and wounded 81 in various Baghdad neighborhoods. April 23, 2009: Suicide bombers launched two deadly attacks, killing at least 55 people in Diyala province and at least 28 people in Baghdad. Four other people were killed in two separate incidents, bringing the total death toll to 87, with more than 120 wounded. March 10, 2009: At least 33 people were killed and 20 wounded in a suicide car bombing targeting a national reconciliation conference in Baghdad. December 11, 2008: A suicide bomber killed at least 55 people at a restaurant in northern Iraq where Arab and Kurdish politicians were working on ways to ease tensions. September 12, 2008: At least 30 people were killed and 45 wounded by a suicide car bomb in the town of Dujail, north of Baghdad. April 15, 2008: A wave of bombings blamed on al Qaeda in Iraq rocked Baghdad and three provincial capitals, killing at least 60 people and wounding more than 100 across Iraq. March 17, 2008: A female suicide bomber apparently targeting Shiite worshippers killed 50 people and wounded at least 65 in Karbala. March 6, 2008: Two bomb attacks in a Baghdad commercial district killed 53 people are killed and wounded 125. Baghdad Bombings: Is Iraq Unraveling Again?